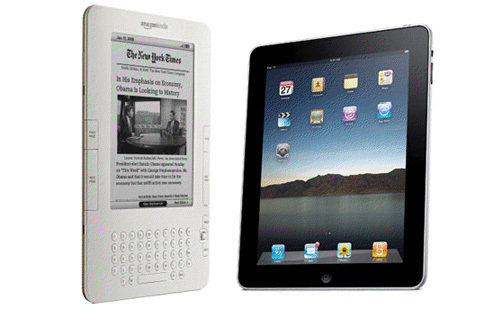 Apple’s iPad was called the Kindle killer from day one of its launch and most Apple fans predicted that the new tablet will wipe out Amazon’s e-reader very soon. None of that happened and Kindle continues to sell like hot cakes according to Amazon’s sales records. It has undergone some major makeovers with massively improved design, lowered price ($ 139) faster functions and a screen that is crystal clear to read even in direct sunlight. Amazon pointed out this fact in a fairly direct tv commercial recently which was shared massively online. The iPad was slated to come to Amazon and Target and now that the day has arrived and sales have begun on both retailers, the talk of the Apple tablet killing the Amazon e-reader has started again. Once again, Apple fans think that iPad sales will overshadow the Kindle and it would be a major business loss for Amazon. The question is why would Amazon want to sell a product that might pose a threat to one of its own popular devices? The answer is simple; because Amazon has everything to gain from selling the iPad. Amazon is not only going to make money through direct iPad sales, as the tablet is still in high demand, but will also gain usage for its official Kindle app for the iPad. The Kindle app has been declared much superior in functions to Apple’s iBooks app and Amazon is hoping to sell more and more e-books through the Kindle’s iPad app. Hence sales of the Apple iPad from Amazon’s online stores mean that that the online stocker’s e-book sales get a boost even if the Kindle goes for a toss. Amazon obviously had a business plan and strategy in place before giving a go ahead to the iPad and it’ll be interesting to see what the outcome of this new development is. Amazon and Target both are offering all six models of the device: WiFi-only 16GB, 32GB and 64GB models, as well as Wi-Fi and 3G-enabled 16GB, 32GB and 64GB models.